There are teenage boys everywhere. 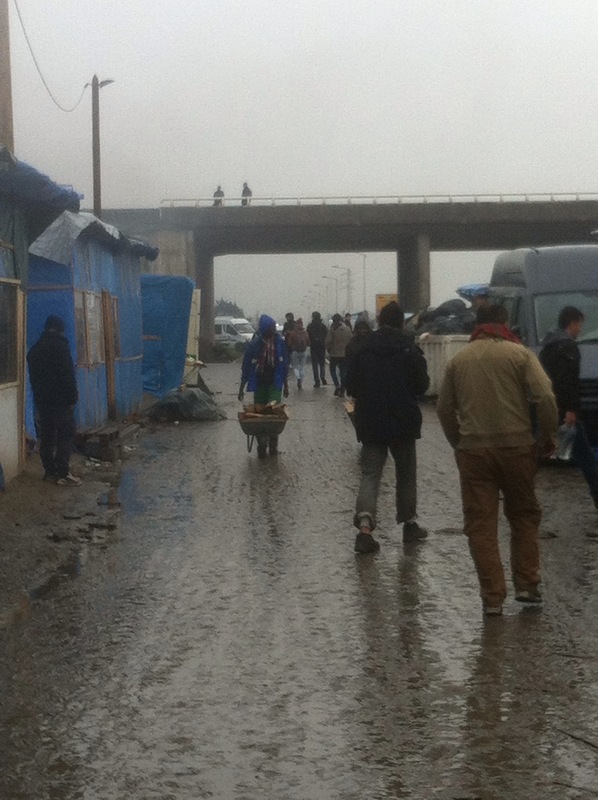 I’m told a story of 13 and 14 yr old brothers who travelled from Kurdistan. They were with their 21 year old brother who managed to get to England two months ago. Now they have no one and have attached themselves to a male volunteer who doesn’t look much older than 21 himself. A child’s right to education is in the International Bill of Human Rights, the Refugee Convention and the Convention on the Rights of the Child. It’s also French and British national law. But the children here do not go to school. Instead they sit here every day in the dirt, sometimes kicking a football around, dreaming of England. If they weren’t traumatised and destroyed before they got here, they certainly will be once they leave. To counter this, l’auberge des migrants has set up a women’s centre and safe space for kids and their mums to come. Because the teenage boys kept drifting in they also set up a caravan across the road for adolescent males where they can hang out, talk to other guys, and when I see them, breakdance. I meet one British woman called Alice who has started a community centre with her own money and serves 400 hot meals a day. She recently burned through her savings and had to start a crowd funding page. I can’t hide my horror when she tells me she sleeps here. I would not be in this place alone after dark. Every week she allows a Narcotics Anonymous meeting to take place in what is essentially her bedroom. She tells me that opium and heroin are big problems here, and they are trying to give people some support. I guess it’s no surprise that in such a place people turn to drugs, but it’s incredible the amount that is smuggled in here. I’m told that most of it comes from England. More people profiting from refugees misery. There are several pregnant women. Mimi from Eritrea is 8.5 months along. She lives in one of the huts built by l’auberge des migrants, a small shack where thin wooden boards are nailed together, but better than a flimsy tent. It’s amazing how tidy she keeps it, all shoes are left outside and inside feels very comfortable, kind of like a blanket fort you’d make as a kid. 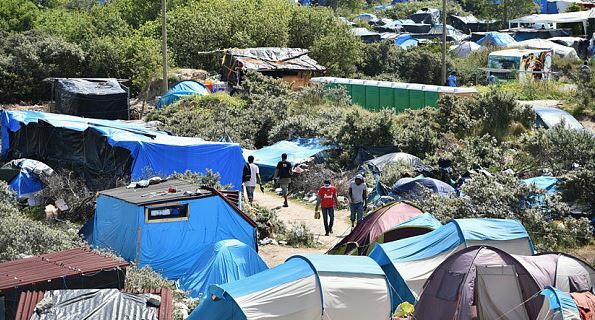 Thanks to l’auberge des migrants there are no longer any women with kids living in tents, they have all been built one of these makeshift cabins that have pitiful looking padlocks on the door. It’s not much, but it’s a space to call their own. Mimi invites us in and offers us tea and food, and tells me how two and a half months ago her husband left and is now in England. She is desperate to get there. I cannot hide the outrage on my face as she tells us they don’t talk on the phone because it is too hard for him to hear about the Jungle. We sit in her tiny room in the dark and the helplessness in her face as she pleads with us to find her a way to Britain is painful. I try and convince her to stay in France and claim asylum here, but she is not interested. 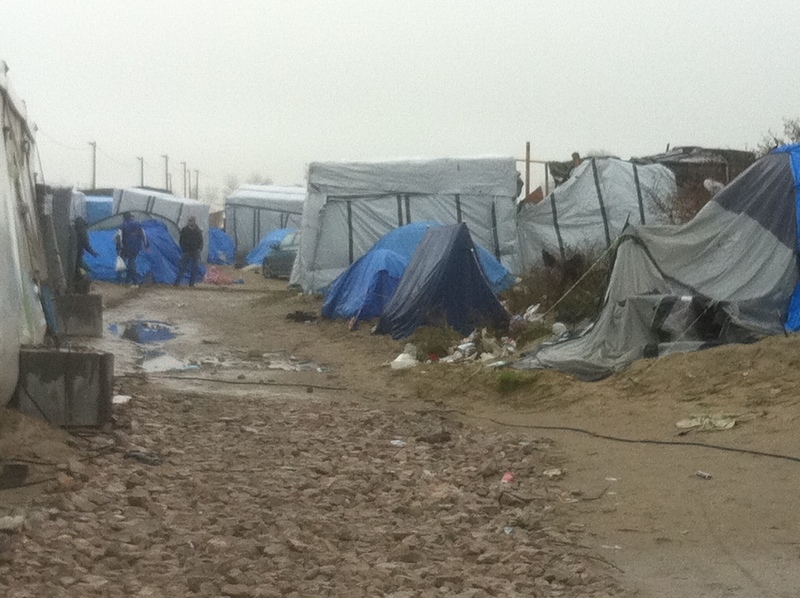 Many refugees tell me they fear the French will be unwelcoming and are more likely to be racist than the British. I am not so sure about this. They also worry about how long it will take to learn the language, though considering some have been in the Jungle for a year this seems misguided. Mimi tells me she is expecting to give birth here. On the floor of her shack, unless of course she goes into labour outside in the mud. I open my mouth to reassure her that there’s no way the authorities would let her have a baby here and someone will get her to a hospital, but I stop. I’m not so sure about anything anymore. I meet two more of Mimi’s friends, also alone and from Eritrea, one of them is also 7.5 months pregnant. I am so surprised by how strongly they are opposed to seeking asylum in France. They treat me with suspicion for even suggesting it and one of them shuts down and just doesn’t want to talk anymore. It’s amazing to me that they have such a rose coloured view of how life will be in England. I don’t get how they can think that having to learn French or go through the asylum process here would be worse than living in this breeding ground of misery. Another thing I’m noticing is that people are less open. In Greece and the Balkans everyone wanted to talk, but in the Jungle residents are so used to journalists coming and asking about their history. At first people were hopeful that telling their stories would result in governments actually doing something, but it has been so long now that they see no point in sharing their pain. They’ve lost all faith that anyone will help. I say goodbye to Mimi and her friends. Though her little home did offer some shelter from the hideous weather outside, it was beginning to get a bit awkward with me sitting there and no one talking. Almost immediately I regret the decision. There is depression and horror everywhere. Anytime a car pulls up refugees crowd around asking for food or clothes or blankets and are yelled at to keep in line. It resembles cattle being herded. Sometimes the nervousness becomes aggressive, though I don’t see anyone get physical. People are much more desperate here than further south. It’s also a lot colder and no one seems to be looking forward to the future. One man pulls me over and asks where I’m from. He then gets excited and pulls out his phone to tell me his nephew is in Melbourne, and have I met him? And can I help him to get there? I wouldn’t have thought I’d be telling anyone the better option to anything was to stay in the Jungle, but if Manus is anything like this and people are locked in…. Maybe there’s always a worse place, I just wish it wasn’t run by my government. There is a huge police presence. Saturday was pretty calm, but I’m told that the cops regularly come in here with tear gas, even using it on women and children. Police brutality seems to be a big problem and adds to everyone’s anxiety; the refugees, workers and volunteers. I know it’s naive to think of police as protectors, but here they are regarded by everyone as the aggressors. Complaints have been made to the local station but are dismissed; one guy tells me he was laughed out when he went in to protest about them using tear gas on children. 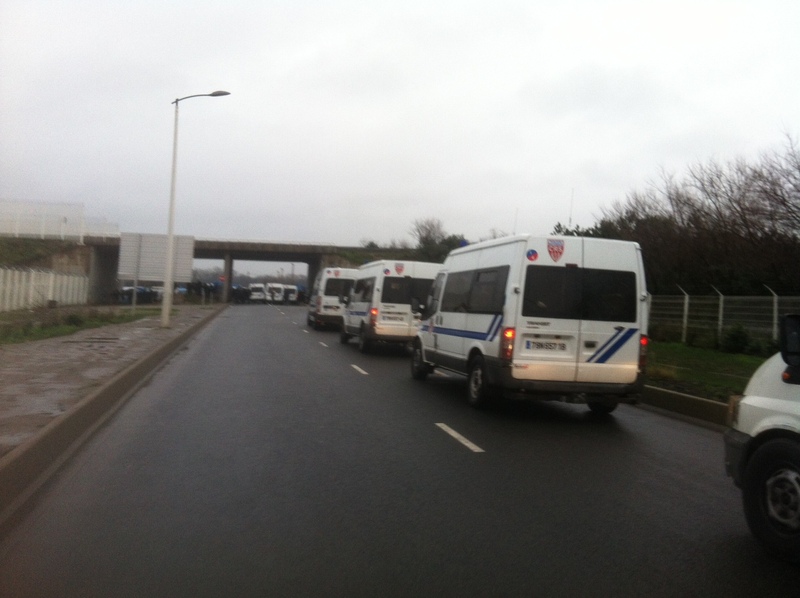 Around the corner from the jungle are a dozen vans full of riot police, just in case. Just in case of what I’m not sure. Certainly not what police are supposed to do. I hear of three different murders that have taken place, and a few cases of sexual assault, none of which have been thoroughly investigated by the police. Why bother, these people aren’t really human and resources are obviously better spent gassing them into submissive terror. When I got back into town I was in a bit of a daze. I went and got a hot chocolate to fix everything and the very cheery woman who made me the most amazing one ever asked me if I was ok. But I didn’t want to tell her what was wrong in case she turned out to be a racist Front National loon and I’d be obligated to hate her and couldn’t come back for another chocolat tomorrow. 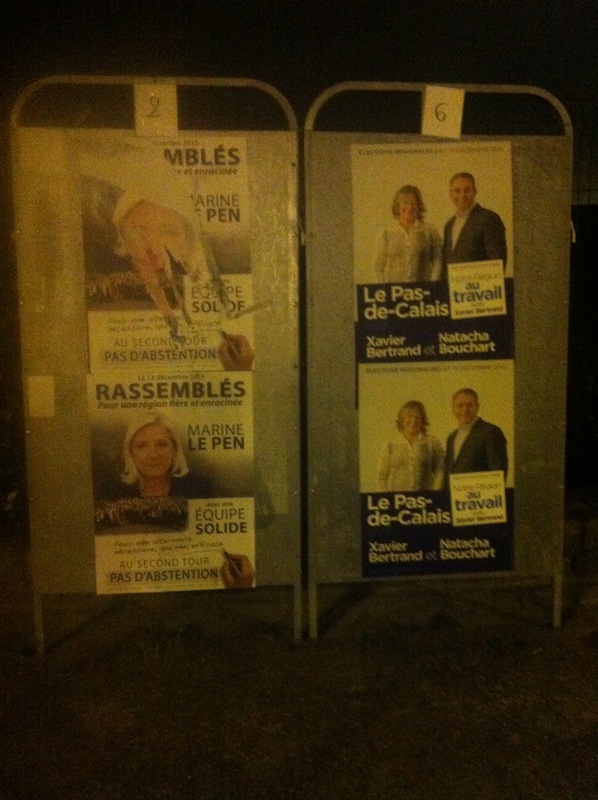 There are posters everywhere of the candidates for the Sunday election, and I am pleased to see that most of the Le Pen ones have been defaced. Calais has a weird feel to it. When you’re in the centre you would have no idea that the Jungle was only 4kms away. There are Christmas decorations and music everywhere, and I wonder how many locals have actually visited the camp and know what it’s really like. When you mention the place to anyone you get a mixture of sympathetic tuts and distasteful expressions. The owner of my hotel was not impressed when I asked him for directions. Certainly people did not on the whole react in a similar manner to what I heard in Greece or the Balkans, though given the sheer scope of the Jungle situation perhaps that’s an unfair comparison.